Mapping Medievalism at the Canadian Frontier aims to challenge and expand current narratives about Canadian history and visual culture. By cutting across historical eras, geographies, cultures, and canonical categories it will sponsor new and unexpected conversations among varied cultural forms that have helped to shape the culturally hybrid Canada—and North America—of today. Mapping Medievalism also serves an important pedagogical purpose. It provides advanced graduate students with an opportunity to collaborate with scholars and museum professionals in the creation of knowledge. The mapping of original conceptual territory via classroom debate, primary research, and hands-on curatorial work aims to prepare M.A. and Ph.D. students for future careers in the art and cultural sector. 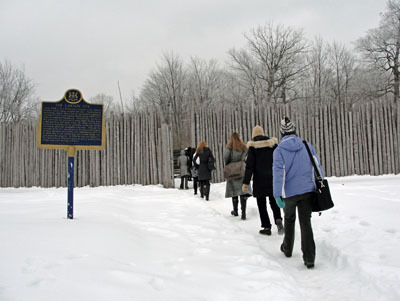 Their professional training will have immediate impact via public programming and the integration of Mapping Medievalism at the Canadian Frontier into the curriculum of the Department of Visual Arts at the University of Western Ontario in the fall of 2010. By exploring a wide range of objects of interest to the public at large, this research and teaching project proposes to encourage learning in a variety of arenas.